The Cities Alliance is supporting the National Slum Upgrading Strategy as part of a Joint Work Programme with the Philippines. In addition to the slum upgrading strategy, the Cities Alliance has also supported initiatives in the Philippines including: the implementation of a CDS programme now completing its third phase; the establishment of the of the League of Philippine Cities (LCP), a network of Philippine cities; and, most recently, grant support to the LCP for a Knowledge Management and Exchange System for City Managers. [19 December 2011] -- The Philippine government launched today the formulation of the country’s National Slum Upgrading Strategy (NSUS) that will guide the efforts of national and local government units in upgrading the slum communities and improving the living conditions of informal settlers in the cities. 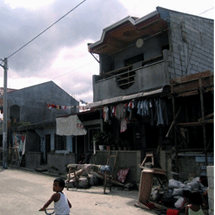 To be implemented by the Housing and Urban Development Coordinating Council (HUDCC), the project supports the country’s thrust toward developing sustainable communities, especially in major cities, by addressing urban issues related to housing, resettlement, infrastructure, social services and job creation in poor urban communities. “Slum communities in the Philippines endure poor living conditions such as cramped living spaces, lack of proper housing and insecure tenure, inadequate access to basic services such as water and sanitation, and exposure to health risks,” said Vice President Jejomar C. Binay, who also chairs the HUDCC. Vice President Binay led the launching of the NSUS at his office in the Coconut Palace, Manila. Funding for this project will come from a US$455,000 (about Php20 million) grant from Cities Alliance administered by the World Bank. Cities Alliance is a global coalition of cities and their development partners committed to scaling up successful approaches to slum upgrading, city development strategies, and poverty reduction. Members of Cities Alliance include local government units, governments (including Australia, Brazil, Chile, Ethiopia, Germany, Italy, Netherlands, Nigeria, Norway, Philippines, South Africa, Spain, Sweden, United Kingdom and the United States); non-government organisations including Slum Dwellers International and Habitat for Humanity International; and multilateral organisations including the European Union, United Nations Environmental Protection Agency, UN-HABITAT, and the World Bank. Vice President Binay said that the national slum upgrading strategy will help local government units identify policy and program options for local slum upgrading that will be integrated into the local planning process. “The resulting investments in housing, urban infrastructure, and social services for upgraded communities will redound to creating job opportunities and improved delivery of social services, thus contributing to local economic development,” Vice President Binay said. As part of the process of developing the NSUS, the project will come up with a comprehensive assessment and database on the condition, issues, opportunities, and risks confronting slum communities. This assessment will form the basis for interventions related to slum upgrading. The Philippines is among the rapidly urbanising countries in Asia with 60 per cent of its population living in urban areas. At its current urbanisation rate, its urban population is expected to account for 75 per cent of the total national population in 25 years. “Many of the Philippines’ poor are informal settlers in urban areas who live in hazardous areas such as waterways, seawalls, and low-lying areas, making them vulnerable to natural disasters like floods and typhoons,” said Mr. Mark Woodward, World Bank’s Sustainable Development Leader. Currently, there are no firm estimates on the number of informal settlers in the country based on an identifiable data set or statistically valid estimating methodology. Estimates depend on the agency or the organisation counting and tend to focus on government-led interventions. For instance, the 2000 census estimated around 239,000 informal households for the entire country. In the same year, other estimates placed it at around 727,000 informal households in Metro Manila alone. The approach used by some non-government organisations and government agencies to estimate informal settlers as 30 per cent of the total urban population will give a figure of about 3.1 million informal households in the country. The comprehensive assessment to be done under the project will address this information gap. This press release was issued by the World Bank 19 December 2011.